The SGR construction in Kenya has now sparked an out row from Conservationists and Wildlife lovers in Nairobi and the world. The Standard Gauge Railway’s construction is already underway and it has crossed a large part of the Tsavo East and Tsavo West sections where it followed more or less the same route that the current old railway lies, without any major outcry from anyone but but now the plan to build the new SGR within the boundaries of the Nairobi National Park has rubbed conservationists and wildlife safari enthusiasts the wrong way. The Kenya Railways Authority after announcing the route that will be followed by the SGR that is set to traverse the Nairobi National Park which is the closest national park to any major city in the world, protesters were seen in the streets of Nairobi heading to the Kenya Wildlife Services (KWS) headquarters in Langata Road. 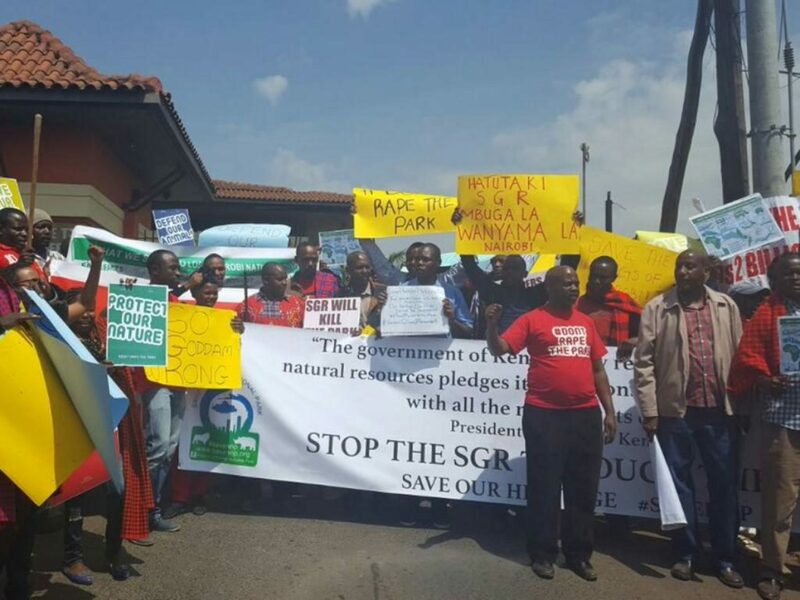 The announcement of the route to be taken was made by the Kenya Railways’s Managing Director a Mr Atanas Maina but it was met by very harsh criticism from the protesters. The Director listed a few measures that would ensure that the construction doesn’t bring much impact to the Park and the wildlife that call Nairobi National Park home, and these includes bridge pillar foundations, abutments, noise deflectors and a fence enclosing the construction area. The Conservationist however insist that that the railway should not pass through the area at all and no one should even contemplate disturbing the wildlife animals by building anything in the park let alone coming up with measures that will minimize the impact. Some of the speakers reiterated what other Conservationists who are against the building of the railways across the park have been sighting as the likely consequences for such a project in the park. Many have been saying that it will increase the human-wildlife conflict and that the animals are likely to venture in the human populated areas like they have recently been seen loitering in the streets of city and the neighboring townships of Isinya in Kajiado for example. Some of the protesters even went to the extent of suggesting other possible routes that the railway line can follow, outside the park and some suggesting that it can cross the park at the southern most tip of the park thus minimizing any conflict between the animals and the humans as well as ensuring that only a very minute part of the park will be affected. This push and pull comes at a time when there has been a ‘put on hold’ in plans to build a highway that was proposed to cross the Serengeti National Park in Tanzania, that also drew a lot of criticism from Conservationists and wildlife safari enthusiasts from all over the world. The highway was highly protested by people who believe that it will interfere with the route taken by the Wildebeests Migration herds that trek thousands of miles from the Serengeti to Masai Mara in what is known as the Great Migration; a world renowned and arguably largest animal spectacle in the world. Most conservationists feared for the Tourism Industry in East Africa and may said it would kill the Tanzania Safari sector which is highest earner of foreign exchange in Tanzania. If the protesters in Nairobi will succeed in stopping the building the SGR across the Nairobi National Park, we can only wait and see and hope that there will be an amicable solution. You may be interested in sampling some of our Tanzania Safari packages and see if any of them interests you. All packages are fully customizable.